If you are interested in World Heritage Sites, medieval architecture, or the history of heresies and their repression, then check this out: a new World Heritage Site in south-west France which was the site of massive church action in the 13th century against the Albigensians or Cathars. Today the Old Bridge (Pont-Vieux), the Saint-Salvi quarter and its church are testimony to its initial development (10th -11th centuries). Following the Albigensian Crusade against the Cathar heretics (13th century) it became a powerful episcopal city. Built in a unique southern French Gothic style from local brick in characteristic red and orange colours, the lofty fortified Cathedral (late 13th century) dominates the city, demonstrating the power regained by the Roman Catholic clergy. 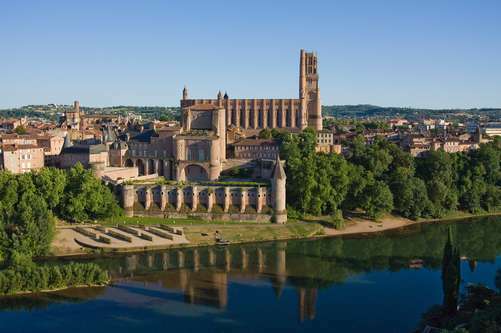 Alongside the Cathedral is the vast bishop’s Palais de la Berbie, overlooking the river and surrounded by residential quarters that date back to the Middle Ages. This entry was posted in Medieval Wisdom for Modern Protestants and tagged Albi, Albigensian Crusade, architecture, France, Middle Ages, World Heritage Site. Bookmark the permalink.